Knowing what your food’s worst enemies are, understanding how they can ruin your food, and how to prevent their havoc will help you preserve your food investment for the long term. If you plan on packaging your own food for the long term using any of the 11 food items that can last a lifetime, or other dry goods, knowing how to properly store these items will ensure their freshness and extend their lifespan. If improperly stored, spoilage can occur at exactly the moment when you need your larder the most. There is nothing more disappointing than seeing your food investment ruined by natural elements or bugs. Knowing what your food’s worst enemies are, understanding how they can ruin your food, and how to prevent their havoc will help you preserve your food investment for the long term. Who Are The Enemies and What Do They Do? The best course of action to preserve your food storage is using a multi-barrier system. Using this method protects your food investment by reducing oxidation of foods, bug infestations, and exposure to increase temperature and moisture levels. Protecting your future food supply can be achieved by simply investing in a few extra preventative tools such as Mylar bags, oxygen absorbers, and food grade containers. Foods can become contaminated by moisture through humidity, rain, and standing water. As a result, molds, mildew and microbial infestation can form and rot stored food, thus making it inedible. Since some foods draw in moisture, such as wheat, rice and grains, the best way to avoid moisture from coming in contact with stored food, is to store it properly. Solution: Those that store food for long term, try to remedy this by using a multi-barrier approach and making sure the food items are away from any possible areas that can flood (laundry rooms, bathrooms, near water pipes, etc), and have been properly sealed to avoid moisture. Additionally, storing your food grade buckets or round cans on shelves or stacked on wooden platforms 6 inches off the floor is another method of preventing decontamination of food. Providing ventilation between the stored containers can also assist in preventing increased moisture levels. Those that live in areas that are prone to high humidity may want to consider adding desiccant packets to their food storage. Desiccant packets only moderate the moisture levels, they do not completely absorb moisture. Being that desiccant is not edible, if the packet somehow breaks open and spills onto the stored food, the entire contents of the container must be thrown away. Desiccant manufactures recommend adding two 1 ounce packets per 5 or 6 gallon pail, or two per large barrier bag. There are certain food items that desiccant should not be added to – specifically: flour, sugar and salt. These items need a certain amount of moisture to stay activated, and if desiccant is added to it, they will turn into a hard brick. Note: make sure the desiccant packet is not touching the oxygen absorber. When sunlight shines directly onto your food pantry or food storage area, photo-degradation (spoilage) occurs and results in losses of pigments, fats, proteins, and vitamins, as well as surface discoloration. Solution: Storing food in Mylar bags is an easy solution to remedy this concern. Mylar bags are metallized foil liners that prevent sunlight, moisture and bugs from ruining food. Investing in the thickest grade of Mylar would be a good investment for your food storage endeavors. The thicker Mylar bags are more durable, and can be reused for future uses. Mylar bags come in different sizes and can easily be rotated into your food pantry. For those who are investing in a shorter term food supply, many simply pour the food contents into Mylar bags, add an oxygen absorber and properly seal the bag closed. This will keep a short term food supply fresh over a given period of time. Other solutions include storing your food items in a dark area not prone to sunlight or temperature fluctuations is the best course of action. If you have to store your food supply in a room with a window, put up curtains or black out material over the window. This is also a good security measure so that others do not see your stored food. Oxygen is another force to reckon with when food storage is concerned. Overtime, oxygen will break down food, cause discoloration, and create staleness in foods. Solution: Using oxygen absorbers greatly prolongs the shelf life of stored food. Because it absorbs the oxygen from the container, it inhibits the growth of aerobic pathogens and molds. Oxygen absorbers come in vacuum sealed packs. They begin working the moment they are exposed to oxygen. Therefore, it is best to work as efficiently as possible. Oxygen absorbers come in different sizes, so pay attention to the size needed for the container. Manufacturers of this product suggest that, 2,000-4,000 cc’s of oxygen absorbers should be added in one #10 can, and roughly 15,000 – 20,000 cc’s for 5 gallon pails. If working with smaller containers such as Bell jars, 50 cc’s of oxygen absorbers should be used. When in doubt on how much oxygen absorbers to use, check with oxygen absorber manufactures. However, it is best to add extra oxygen absorbers rather than not enough. Oxygen absorbers are not edible, not toxic and do not effect the smell and taste of the product. Fluctuations in temperature create an imbalance in the environment that the food is stored in. Ideal temperatures for stored food should be between 65-80 degrees F.
Solution: Typically, people store their food storage in unused closets or areas in the home that do not have large exposure to sunlight. Ideally, the area where the food is stored should have access to air conditioning. Those that do not have extra space in their homes have used their basements, root cellars and have even used temperature controlled storage warehouses. To ensure the area where the food is stored is at adequate temperatures and moisture levels, install an indoor thermometer and humidity gauge. Bug infestations can also occur from improper storage methods. 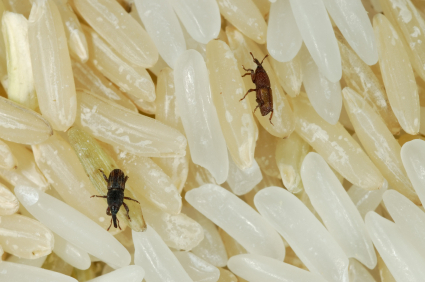 Nearly all foods are susceptible to these pests. Typically the stored food product becomes infested at the warehouse it was processed at. Nearly all dried food products are susceptible to insect infestation, including cereal products (flour, cake mix, cornmeal, rice, spaghetti, crackers, and cookies); seeds such as dried beans and popcorn; nuts; chocolate; raisins and other dried fruits; spices; powdered milk; and cured meats. Insects will chew their way through cardboard, plastic or foil liners, or folds in the packaging system. This is why a multi-barrier approach to food storage is suggested. Solutions: There are few different ways to prevent bug infestations. Learning the different methods can help you choose which is right for you. Freezing Method – freeze food that will be stored for 72 hours. Freezing will kill any bug eggs. Heating Method – Heating the food supplies is another option. Heating the food to be stored at 150 degrees F for 15-20 minutes will kill any bugs or eggs as well. Organic Option – Diatomaceous earth are the fossilized remains of diatoms. They are organic and are safe to use on food. Use 1 cup to each 25 pounds of food. After 20-30 minutes, check to see if dry ice has completely evaporated. If not, wait another 5 minutes, then check again. When dry ice has completely evaporated, remove material and seal container. on bottom of 5-gallon storage container, place 1/4 lb. of dry ice under non-conductive (insulating) material, such as Kraft paper. A little preventative maintenance can go along way in terms of food storage. Understanding the different methods for storing your food supply for short or long term storage will help you get the most out of your food investment. 1. How many years of storing are we talking about, when talking about short term and long term. 2. Is short term just sealing the foods in the Mylar bags with an oxygen absorber and long term putting the mylar bag in a food bucket. 3. Can I store baked beans or soup in the mylar bags with the oxygen absorbers. 4. Can I seal ready made meals like pasta and mince meat in a mylar bag with an oxygen absorber. Glad to hear that you started making a food investment. To find how much food you need for a given emergency, check out the Ready Nutrition food storage calculator. Long and short-term food storage is contingent on the particular type of food and the way you pack it. With your short-term food supply, this is essentially the pre-packed foods you purchase at the store. Your longer-term food supply is the foodstuffs you will re-package into mylar bags and plastic containers. If foods are properly packed, some dry foods can last a lifetime. When re-packaging food for longer-term emergencies, you want to stick with the dry goods like rice, beans and wheat. Moisture is one of food’s worst enemies and can quickly deteriorate the freshness in food. I would not store baked beans and soups in mylar bags. Mylar bags are meant to be a more durable protective liner (compared to grocery store packaging) to keep natural elements and insects out. If you want to have baked beans and soups in your emergency supply, I would purchase the canned version. I’m not sure what you mean by ready made meals. If you mean ready meals that are dry such as Hamburger Helper and such, I would look on the back of the box and see if there are any perishable ingredients. If you have questions, you can contact the manufacturer and ask them. Typically, ready made meals that are in a box last about 1 year, so they would be a good consideration for a short or long-term prep item. What about vacuum sealing food? I’m surprised it’s not mentioned. Any type of re-packaging of food for short or long-term is good. So, if you have a food sealer, use it! I typically suggest Mylar, because I feel more confident that the seal will not break as the food sealer’s sometimes do. But, like I mentioned, any type of re-packaging is better than none at all. That being said, there are times when I do use my food sealer along with the Mylar liners to re-packaging my food. I’m vacum sealing everything prior to sealing in a Mylar bag within a plastic bucket. I do this so I can open a package and have a variety of product in smaller quantities. The other reason is to be able to use and replenish these items during the storage period. Since everything is pre vacume sealed prior to the Mylar bag I’m assuming a couple of absorbers should be plenty. I’m also having a tough time figuring out just how long a certain food will store if kept like this. I know the difference between white and brown rice with respect to storage rates but is there a general rule? Legumes forever? Macaroni or spaghetti forever etc? Great work. The idea of havinga secondary seal for your stored goods will ensure that if the first seal is broken, the second will be a fail safe. I would think the storage times for the stored goods could be extended using this strategy. Essentially, with the double seals nothing is getting in to affect your foods. Just remember, to use the food you store and rotate a fresh supply into your stored goods. I have had a lot of people ask me the same question about pouring canned soups into Mylar bags to reseal. To answer your question, Mylar bags should be used for dry goods. Typically, when you preserve “wet” foods like soups and stews, the environment of the container needs to be sterile in order to keep out organisms. In all honesty, I do not believe that you would be able to sterilize a Mylar bag for this purpose without compromising the bag. As far as how MREs are able to stay fresh in a “Mylared” environment, I do not know. The preservatives that are in MREs could play a large role in this. You might be able to contact a facility that makes MREs and ask them. Thank you so much. I will attempt to contact them and find out..If I find out something, then I will post it here…Again thank you so much.. Yes, please let us know. Like I mentioned, a lot of people have asked the same question, so I am very curious too. I experimented once with storing canned soup. I opened a can of some kind of beef stew (don’t remember the name) I divided the stew into to smaller Tupperware containers and then I froze it in the freezer. The next day I vacuume sealed the frozen cube of stew. When it melted it reminded me of a military MRE entre. I put it in the cabinet at room temperature for several months then I ate it, it was just fine. If you are going to store soups I would just dehydrate them. For a very long time I would cook hamburger helper everyday then dehydrate it for storage, if you are wondering why…I have A LOT of dehydrated ground beef. I also have A LOT of hamburger helper stored away. One day I made hamburger helper using dehydrated beef and then I realized how inefficient this was. If you don’t reconstitute the beef first it is chewy, not to mention you still have to cook the HH as directed on the box adding water, milk, beef, cook for 10 min or so yadayada…but if you dehydrate the entire meal and then prepare all you do is add water, boil for 90 seconds and its perfect and it doesn’t require 10-15 min of wasted valuable fuel to prepare. You forgot the biggest danger to your stash and that is the local and state Police. I like to buy in bulk, and usually have a freezer full. Having a pressure canner and supplies means you can preserve all that meat and many other frozen items that would be lost if the power goes out. If you have fruit trees, and a good garden, canning is a great way to preserve many items. trying the freezing method. However, I am worried about moisture and mold. packaging or laid out flat on a sheet? desperate at this point. Thanks for anyone that lend assistance!